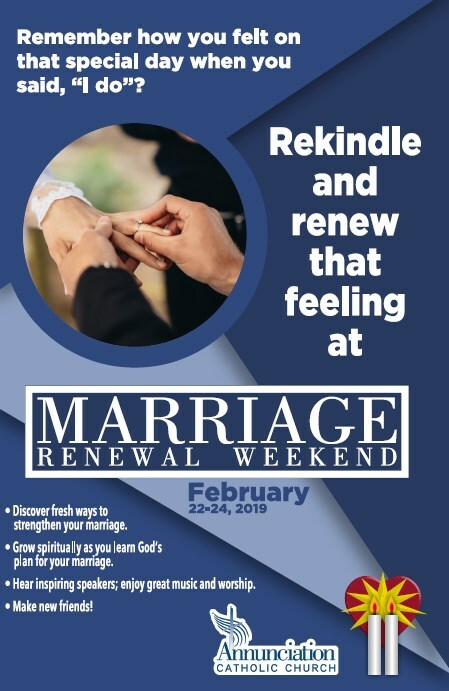 Thank you for your interest in Marriage Renewal Weekend. The weekend is at capacity. Like everything else, a good marriage must be nurtured. Whether you’ve been married for six months or 60 years this weekend is for you. Annunciation’s Marriage Renewal will provide the opportunity to discover fresh ways to strengthen your marriage and grow spiritually in the warmth of the church community. The weekend is for all married couples regardless of background or what state your marriage is in. Make the best investment on you and your marriage, time for each other. Discover God’s Plan for Marriage, Communication, Forgiveness, Intimacy, and more as ordinary couples share their experiences, trials and triumphs. Activities to enhance self/couple awareness. Opportunities to share with others, as you feel comfortable in a climate of safety. 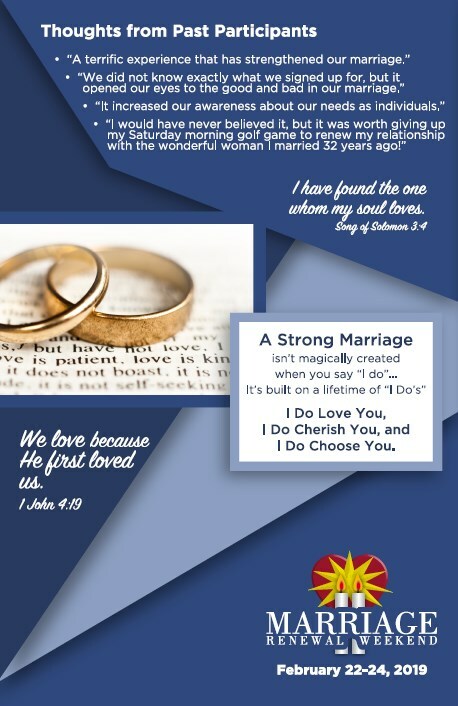 Experiences to help deepen one’s understanding of the Sacrament of Marriage. Strategies that promote a connectedness with the parish community. Great Food, Laughter, New Friends. WHO SHOULD ATTEND: The weekend is for all couples – whether you have been married 6 months or 60 years. It doesn’t matter if your marriage is fantastic, faltering or somewhere in between. Both Catholics and non-Catholics will feel comfortable and are welcome. COST: $35 per couple registration fee. There will be an opportunity for an additional donation at the end of the weekend.